We sent the summary results of our survey (What does Telco 2.0™ mean to Operators?) a couple of days ago. I am delighted that several respondents saw the light and decided to get the full results and tons of additional analysis in our updated market study and quarterly report. Below are some of the results from the survey and some Frequently Asked Questions we have had from journalists about the survey and the market study. These snippets build on previous posts about the survey results. 2008 was forecast to be the year Wi-Fi starts to enter the mass market (and 2009 when it becomes ubiquitous in cities). In 2008, respondents also predict a major European fixed incumbent operator will be bought out by a competitor (any guesses for which one?) and fixed VoIP will become mainstream. 2009 is the year when next-generation mobile broadband is forecast to be commercially launched in the form of Wi-Max, Flarion etc. Interestingly, few people predict these technological changes leading to significant business model change in the near-term. 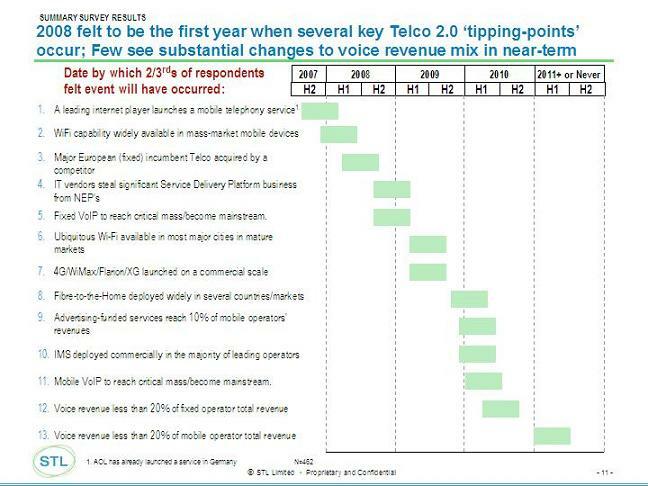 Voice revenues were not predicted to fall to less than 20% of fixed operator total revenue until mid-2010 and most predicted that it would be 2011 (or never) that the same happened on the mobile side. It is interesting that BT claims that already voice revenues account for less than 8% of its business but, as a few pointed out, it is always difficult to separate voice revenue from connectivity (line rental) with the latter usually subsidising the former. We collected a huge amount of data about perceptions of company strategies. It has been very interesting to see which regions of the world and individual companies are perceived to be protectionist, dump-pipes, platform players or some combination of these. We also asked respondents to give their top-picks for leading operators in terms of preparing for the future. 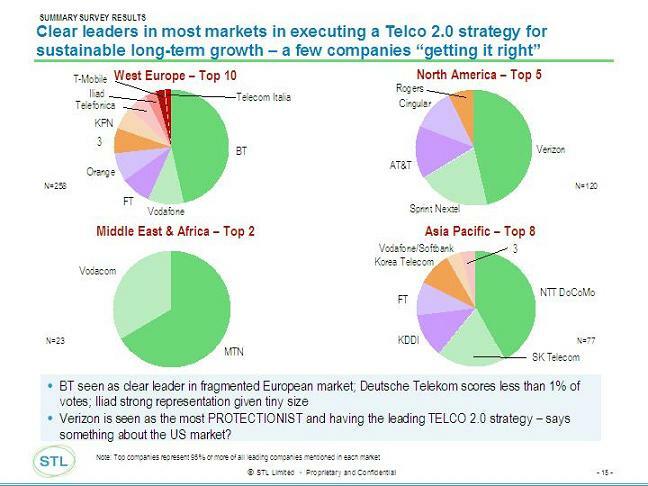 It was remarkable how few companies were selected as leading Telco 2.0 lights, even in very fragmented markets like Europe where the Top 10 companies represented well over 95% of all selections. Unsurprisingly, BT was considered the leading company in Europe followed by FT/Orange. No sign at all of Deutsche Telekom in the Top 10 but a showing for tiny Iliad indicates the company’s ground-breaking strategy in France. Verizon polled 45% of votes in the US despite the fact that it was also considered by more than 50% of respondents to have a protectionist (walled garden) strategy. Does this say something about the consolidated North American market? Can you give me the breakdown of participants in the survey? 27% from operators and services providers (17% Fixed/Converged, 6% mobile, 2% Internet specialist, 2% ISP); 15% NEP; 22% IT Vendor; 11% Telco disrupter; 25% Other (Consultant, Analyst, Academic). Which type of operator has the most urgent need to change - fixed or mobile? Difficult to generalise. This all depends on local market forces and company positioning. The survey and our analysis shows that fixed operators are currently leading the charge to the new world order so mobile operators have further to go. But the reason fixed operators are adopting new business models faster is simply that they have to - the barriers to entry for service providers are lower in their market. Mobile operators still enjoy the protection of licensed spectrum. IP has created a few holes and they are, quite rightly, exploring new opportunities and assessing threats (from such things as mobile VoIP) but they are experiencing less pressure on their walled gardens. According to your survey, operators should move away from the walled garden business model? Eventually, yes. But again the speed of change should be driven by the need to respond to external pressures. The walled garden model is VERY profitable and there is no point in operators putting existing revenues at risk until they have to. Operators will move form walled garden to more open strategies when they have to; the difficulty will be managing the migration from the old model to the new. Some will get this right, others will struggle. So how can operators move away from the walled garden? This is the $6 million (or $3 trillion) question that the industry faces. The Telco 2.0™ Initiative we set up is all about facilitating these changes through events, research, training and consulting. The survey did reveal some key barriers to change. These varied by market but there was a universal concern about VP and Director level management which suggests that respondents feel that EXECUTION skills are a key barrier to success. Concern about the lack of SERVICE INNOVATION in operators was also evident by the importance of service provider partnerships and in the support of structural business separation (allowing greater focus on retail/service delivery business). TECHNICAL issues are not seen as a major barrier hence partnering with IT-focused vendors is a low priority. Is the business model you talk about more about adapting the advertising model? Well, advertising is part of it. But advertising alone is not going to enable sustained growth when subscriber revenues from voice and messaging are under pressure. We believe that operators need to innovate in their core voice and messaging services and adopt new business models to grow. Advertisers are one example of operators moving to a new two-sided business model where they provide a platform for 2 groups (in this case advertisers and consumers). This requires operators to develop new skills and expertise and carve out a clear niche in the centre as Google has done with on-line advertising. Isn’t the flat rate model (eg 3’s X-series) risky? There are always risks if you are moving from a per-per-minute (metered) model to a flat-rate model. Not least, is the problem with cannabalisation of an existing revenue stream. Ultimately, we believe more and more operators will move to this open, flat-rate model and will have to manage the cannabalisation risk. The timing of this move will largely be driven by an operator’s market position - the weaker operators in the market, like 3 in the UK, will move first because they have less to lose in terms of existing revenue and more to gain from stealing market share from the market leaders. The risk (and therefore challenge) is greater for these leaders who will have to decide when the share loss to competitors like 3 is sufficient to justify the cannabalisation of their existing voice and data revenues and moving to a similar model. These are the players that need to be trialling these models now to learn about how to implement them effectively. Of course, some risk can be offset by thinking through how to position a new service or business model. So do you see trialling as important? Yes very. This came out very clearly in our brainstorm in October and I have no doubt that this will be confirmed in the one in March. This is a time of volatility and change with new competitors and business models springing up all the time - Skype, Blyk, 3’s X-series, etc.). Operators need to take a leaf out of the internet players and organise trials to learn about what services and business models will be successful. Trialling is not an excuse for poor service quality or leaving products in beta mode indefinitely but is critical way of supporting decision-making in a changing world. Try the Telco 2.0 incubator approach - more on this anon or drop us a mail!